Before the New England Patriots take on the Tampa Bay Buccaneers on Thursday Night Football, they will be taking their first ride in the new team jet. The team is set to depart on Wednesday in one of their two Boeing 767s, that is rightfully nicknamed AirKraft. 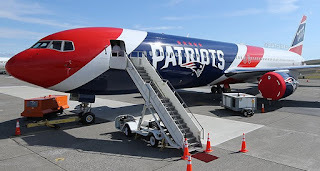 It was announced in August that the franchise had purchased these planes – one that is used as their main transportation and one that is used for backup – because of rising costs of team travel and not having enough room for players, equipment and personnel. ESPN reported that roundtrip flights can cost up to $4 million a season, while major carriers also have been retiring larger planes that were previously used for team travel. “By getting our own plane, we can handle all the people and all the equipment on every trip,” said Jim Nolan, chief operating officer of Gillette Stadium.